Apple has removed the ability to rent TV shows from both iTunes and its Apple TV, taking away what was just last year one of the major advertised selling points of the $99 streaming-centric set-top box. The option to rent episodes of TV shows is no longer available on either the Apple TV, or when browsing content via Apple's iTunes application. Previously, participating networks offered users the ability to rent a TV episode for 99 cents, with 30 days to begin watching and 48 hours to complete it. As further evidence that the ability to rent TV shows has been removed completely, an Apple support document entitled "iTunes Store: How to rent TV shows," has been removed from the Web. A Google cache of the page is still available. In addition, Apple's official page promoting the Apple TV no longer makes any mention of 99-cent TV show rentals. Users are told that they can rent movies, while the page offers users the ability to "buy your favorites, instantly" for TV episodes. Apple paved the way for the change earlier this month, when the company added the ability to buy and stream iTunes TV shows on the Apple TV. Previously, the set-top box was limited only to streaming rental options, or content that had already been purchased on a Mac or PC and was saved locally on that system. 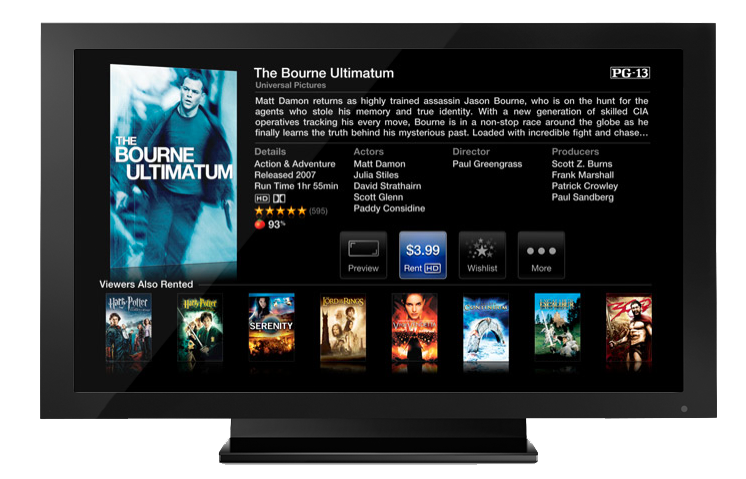 Released in 2010, the new Apple TV represented a shift for the company, as it pushed studios to allow cheaper 99 cent rentals of TV shows, rather than costlier permanent purchases. But some studios have been reluctant to participate, calling Apple's 99-cent model too inexpensive. The change to no longer allow rentals seems to suggest that Apple's experiment never paid off in terms of sales, or gained any new support from studios. Previously, Fox and ABC were the only two of the "big four" major U.S. networks that had participated in Apple's streaming offering. Last month, AppleInsider revealed that Apple has been selling a half million units of its set-top-box per quarter. Though sales of the Apple TV are much higher than other similar devices, Apple has famously referred to the relatively niche product as a "hobby," as it doesn't command nearly the kind of sales or attention as a product like the iPhone.